reading difficulties in patients with glaucoma can inspire the development of electronic reading applications. Research has shown that patients with glaucoma read slower when read in silence for longer periods of time. Your reading speed is more likely to decrease over time due to fatigue reading. The study involved two groups. Both groups were evaluated by two tests of reading aloud (IREST and MNRead), a test of sustained silent reading during a period of 30 minutes, and an assessment of understanding for the materials sustained silent reading. In a study of 63 patients with glaucoma and 59 control patients with a diagnosis of suspected glaucoma complete 10 reading activities for low vision evaluation. Participants were evaluated with oral questionnaires, which were analyzed with the results of the reading activity. Patients with glaucoma have a lower reading ability compared to controls, which was associated with a greater loss of visual field. They also reported greater difficulty in reading all activities except the puzzles. 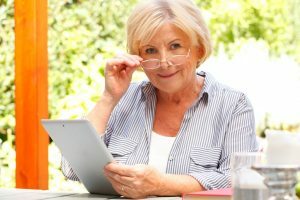 Researchers concluded that patients with glaucoma have a lower reading ability and the lowest participation, especially for tasks that require prolonged reading.